On a work surface put the flour. Create a well in center. 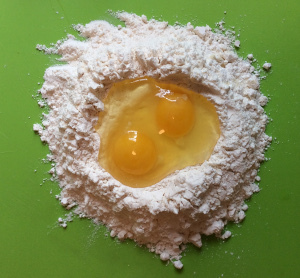 Put the eggs in the middle of the flour. 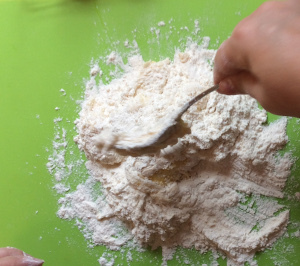 Carefully beat eggs with a fork and mix gradually with the flour, stirring from the outside in, to avoid breaking the flour “bowl”. 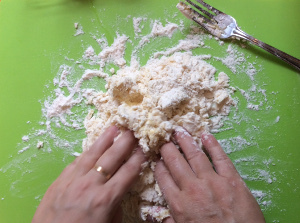 Knead dough, adding a little flour as necessary until it’s smooth and elastic, about 10 minutes. Cover or wrap in cling film; let rest for at least 5 minutes. 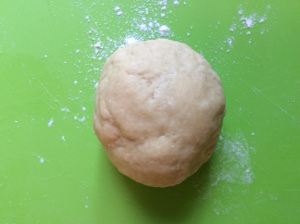 Divide the dough into two or three parts. Roll each part as thin as you can using your rolling pin. Flatten each part into a rectangle (cover others with a towel). 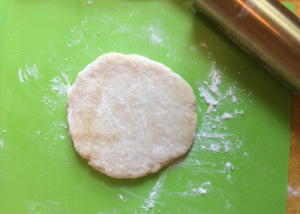 Starting with a small rectangle of dough, run it through your pasta maker at the largest setting, #1. Once it comes out, dust lightly with flour. Run it through the machine again on the same setting, then turn the setting to 2. 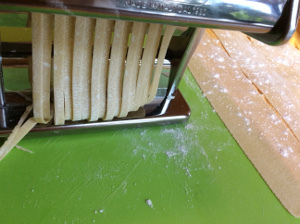 Decrease setting one notch and roll pasta through again; repeat, decreasing setting by one notch each time. Proceed to pull until No. 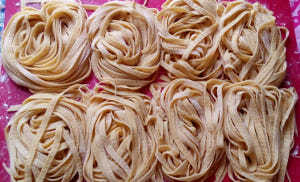 5 (if you like thin pasta, you can proceed until No.6). 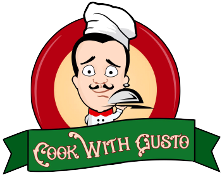 Dust the dough with semolina or flour every time you change the thickness. Sprinkle sheet with flour. Repeat with remaining dough. Allow the sheets to dry before cutting (they will have the consistency of a cardboard – they will fold but do not break). 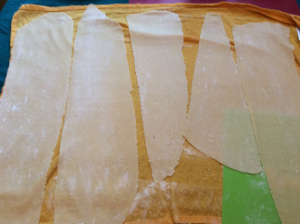 Roll the pasta sheets on themsleves, cut the width you prefer or – like I did – use the cutting tool. Give your tagliatelle a nest-like shape and lay on a tray. Cover with a kitchen towel if you store in the fridge. Tagliatelle and sauce pairing tips. A traditional pairing is tagliatelle with ragù, recipe here. Or as an alternative, our Bolognese sauce. 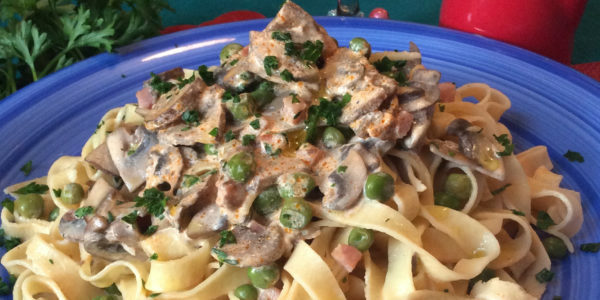 You can also pair tagliatelle with Boscaiola sauce, the recipe is here. Other delicious sauces are available on our eshop, for example a high quality tomato sauce like country basil pasta sauce.